There’s another variation of grilled cheese my family calls the French Toasted Grilled Cheese. This variation completed our family’s grilled cheese evolution because once Mom heard about it (from a friend, sister, magazine?) she forgot all about her toaster oven. Fred offered to make me grilled cheese that evening I wasn’t feeling well. I was instantly transported back to childhood when I saw his open-faced toaster oven creation: one slice of white bread with one slice of American cheese on top. This was exactly how my mother used to make it. I had forgotten about this method because after my sister had fixed me an authentic two-breaded grilled cheese with lots of butter, I insisted on this from Mom, too. My sister recalls the open-faced toaster oven method from before I was born, but now claims, “I only make it that way if I’m on a diet or something.” She suspects she learned the authentic two-breaded grilled version when she worked at G.C. Murphy’s lunch counter in Wildwood, NJ. Ah, but our family’s grilled cheese evolution was not over yet. Fred’s open-faced toaster oven memory jolt got me thinking about the mundane grilled cheese sandwich. I remember eating lots of grilled cheese as a graduate student. My tiny Philadelphia apartment did not have a kitchen but instead a kitchen unit with two electric burners and no oven. Grilled cheese was a staple as I had to stretch a little bit of money a long way. In the current economic climate I am learning to live simpler and eating simpler is not a bad idea either. I threw out some queries on Twitter, my favorite real-time crowdsourcing research tool, asking what style grilled cheese my Tweeps eat. The answers all included butter and the authentic two-breaded grilled method. “Extras? I’m a purist but never turn down bacon” (@billhemmig). “No tomato added—that reminds me of elementary school lunches” (@mccannl). Many replies identified grilled cheese as a comfort food and recalled eating it often in childhood: “Grilled cheese is a known cure of malaise, or ennui, at the very least” (@killerlouise). Beyond my Twitter poll, I did some magazine research. While I did not find any mentions of debates between the authentic two-breaded grilled version and the open-faced toaster oven method, I did uncover grilled cheese variables and variations. The variables are additions to the basic cheese and bread sandwich: slices of tomato, apple, ham or bacon inside or maple syrup or tomato sauce drizzled on the outside. 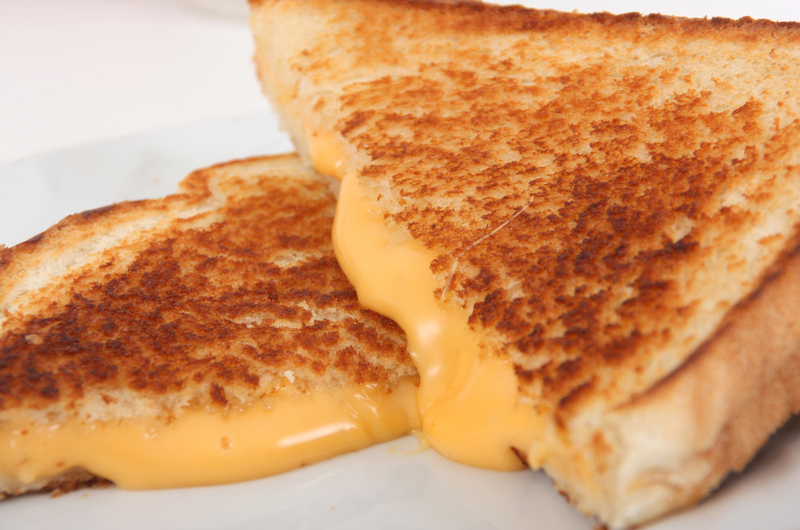 Most grilled cheese sandwiches are made from white or wheat bread, but many kinds of cheese are used. American, Swiss, Provolone and cheddar are the most common choices because those are the kinds of cheese people have in their refrigerator. I used Gruyere once. It was leftover from when I made French Onion Soup where it was delectable. In a grilled cheese sandwich, though, it bit me back. Almost any kind of cheese will work, but most grilled cheese experts agree not to mix cheeses because their unique character will be lost. Oh, and you should know this: April 12 is National Grilled Cheese Sandwich Day! Besides the variables, there are varieties of grilled cheese. We’ve explored the intricacies of the authentic two-breaded grilled version and the open-faced toaster oven method, but I discovered another in Paris! The croque-monsieur was on almost every café menu. This translates loosely to “crispy mister” and it is simply a toasted ham sandwich with melted cheese on top. (Add a fried egg for a croque-madame.) Surprisingly, in the city famous for baguette bread, Parisians use flat white bread for these dishes. Mexican restaurant devotees can relate to this: a quesadilla is really a version of grilled cheese. I make these often in a frying pan lubed with a puddle of melted butter: substitute tortillas for bread (I prefer flour tortillas but corn tortillas work, too), and use shredded cheddar cheese. One can throw in some diced onion and pepper, tomato, cubed chicken, chili powder, cumin, or hot chilis, too. Quesadillas are usually cut into wedges and served with salsa. Yummy. This easy recipe came to Mom and me by word-of-mouth in the 1970s. After we tasted this, we never went back to the open-faced toaster oven variety. The recipe is forgiving: use the kind of bread and cheese you have on hand. Ingredients for one sandwich are listed. Melt the butter in a sauté or frying pan over medium-low heat. Make a sandwich with the bread and cheese. Blend the egg and milk in a shallow bowl. Soak the sandwich on both sides in the egg/milk mixture and then transfer to the pan. Cook about one minute on each side until they are golden brown and the cheese begins to ooze. This is a knife-and-fork sandwich. Try adding whichever variables you like in regular grilled cheese (ham, tomato, bacon, apple, maple syrup. Fred sprinkles his sandwich with cinnamon before cooking. I love cheese! This dish sounds delicious but I do have a question concerning its health giving properties. Will it enhance my skin? Probably not, but I will still eat it anyway. Yum, all this talk of grilled cheese also brings me back to my childhood. Of course then it was just simple grilled cheese. I have to give your recipe a try.